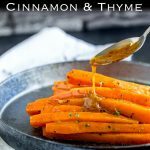 These Cinnamon and Thyme Brown Sugar Glazed Carrots are the perfect side dish for Thanksgiving or Christmas. They cook on the stove top leaving more space in the oven, they taste amazing and are a hit with adults and children alike. Glazed with a wonderful mixture of brown sugar and butter, they are easy to make and so delicious. 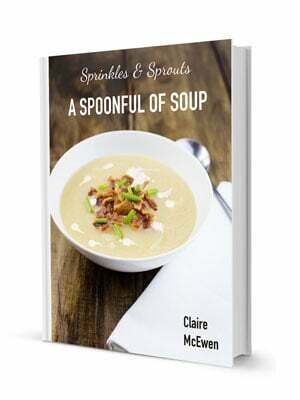 A great addition to your dinner table this holiday season. The amazingness of these glazed carrots comes from that drizzle. Just look at that drizzle!!! Glossy, buttery deliciousness! Packed with brown sugar, cinnamon and thyme. My boys get excited whenever they see these babies cooking on the stove. Which is one of the wonderful things about this recipe. Kids love them, adults love them and there are never any left at the end of a meal! Honestly they are amazing! Oh so sweet, rich, delicious and just the most perfect holiday side dish going! Although saving these for Thanksgiving, Christmas or Easter would be a carrot injustice! 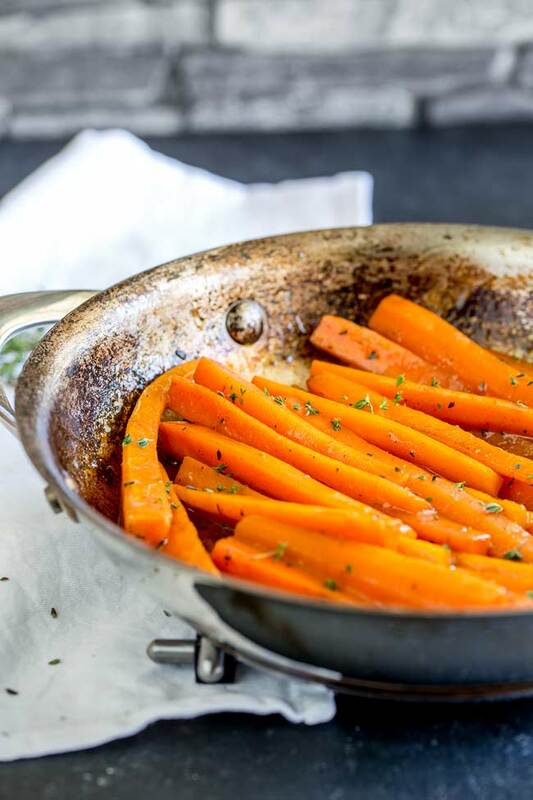 These Cinnamon and Thyme Brown Sugar Glazed Carrots don’t deserve to be locked away for the holidays. They are the perfect side for any occasion! A simple grilled chicken breast with a pat of Bacon and Maple Butter, a side of these brown sugar glazed carrots, some Crispy Smashed Thyme Potatoes and you have an amazing dinner! 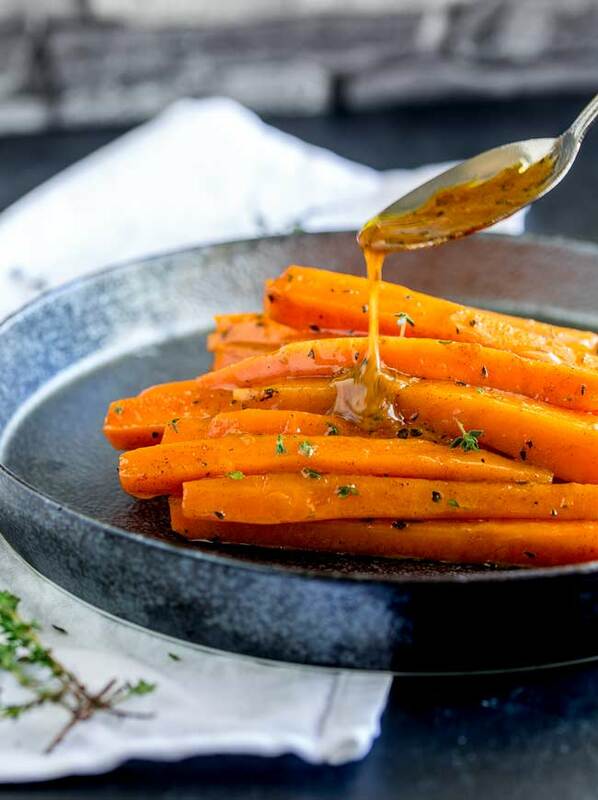 Other than being delicious, perfect for plenty of occasions these Cinnamon and Thyme Brown Sugar Glazed Carrots can be easy to double or even triple. You just need a bigger sauté pan! So whether you are serving 4 or 40 – well maybe not 40!!! Okay lets try 4 or 12 people, this festive season, these glazed carrots will serve you well. Why not pin this recipe for Cinnamon and Thyme Brown Sugar Glazed Carrots Pin it here. Peel the carrots and remove both ends. Cut the carrots in half lengthways and then cut each half in half again. Then cut these quarters into 2-inch-long batons. 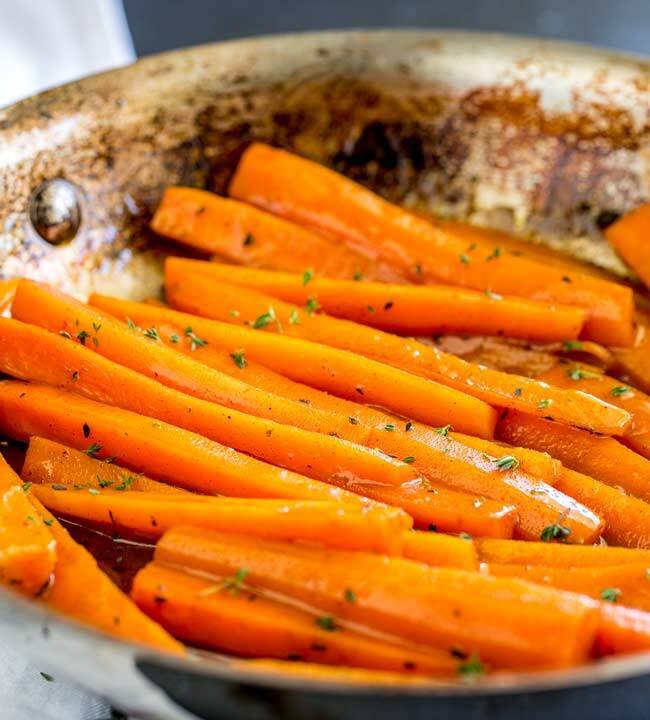 Place the carrots, water, butter, sugar and cinnamon in a medium saucepan over high heat. Bring to a simmer, reduce the heat to low and Cover. Cook for 12 minutes. Uncover, turn up the heat and and cook for a further 2-4 minutes or until the carrots are tender and the glaze is thick and glossy. Serve with some fresh thyme garnish. 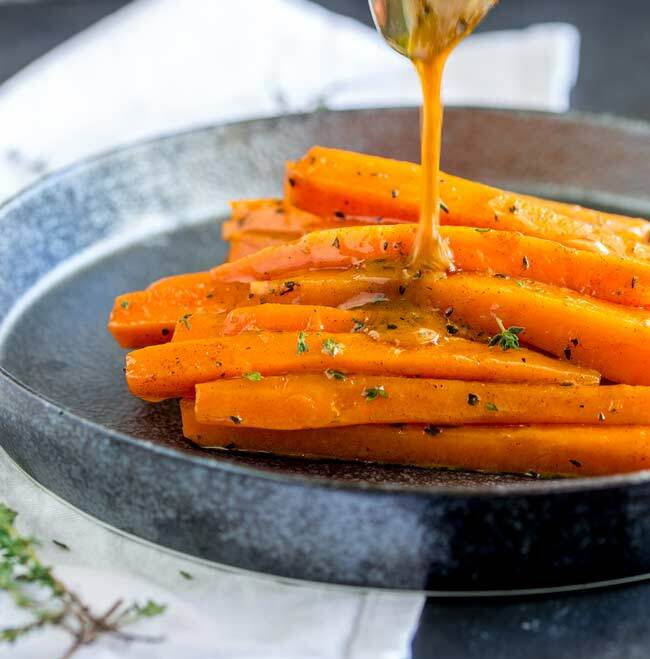 If you love food why not subscribe to my newsletter, I will drop you an email every now and then, just to say hi and send you a couple of recipes I think you might love, like this Cinnamon and Thyme Brown Sugar Glazed Carrots. This is perfect for Easter. I’ll be going to someone else’s house, so I just have to bring one tasty dish! Pinned!I love these favors! Always looking for ways to make veggies more appealing to my 2-year-old. It’s a struggle but these might do the trick! Oh the struggle is real, I have one veg loving kid and the other can spot a speck of green from 1/2 a mile away!!! Luckily he is a big salad fan! There’s kind of a love/hate thing going on with carrots in my house. Half the family loves them — the other half can’t stand them… I’m in the “pro” camp and definitely want to make this recipe. We have the same thing with sweetcorn!!! My youngest is a raw carrot fan too. Well he was, but he is at that age where his teeth are getting wobbly and falling out, so the crunchy veg aren’t his favorite at the moment. He does enjoy them cooked still. I hope you do too.